I found these spice jars while I was thrift store shopping the other day. I fell in love with the little wooden lids, PLUS they were only 99 cents each. My Mother accidentally broke my antique pepper shaker that I had and so I decided to turn these spice jars into my everyday salt and pepper shakers. I had some etching cream and settled on putting the classic “s” and “p” on them. Here is my tutorial on how to etch glass. Here are the spice jars I got. I have never (or don’t recall) seeing any like this before. I put them in the washing machine to make sure they were clean. 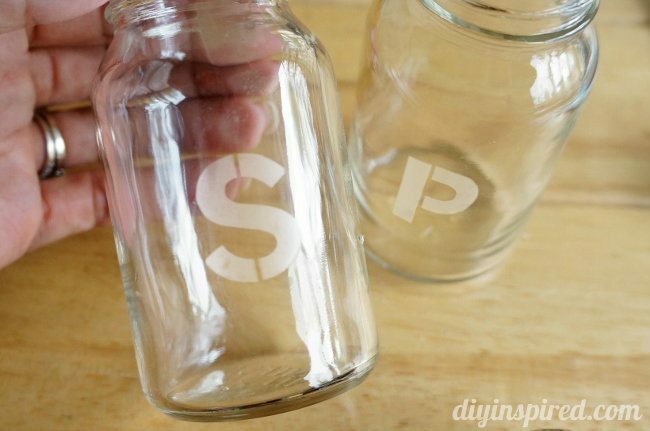 I used Martha Stewart’s adhesive letter stencils which make this project SUPER easy. As you can tell by this photo I used them often. Make sure your glass is completely dry. Once your stencil is in place, apply an ample amount of etching cream onto your surface. Wait 1-3 minutes and rinse the etching cream off under cold water. Remove the stencil. Voila! It works in just a few minutes. 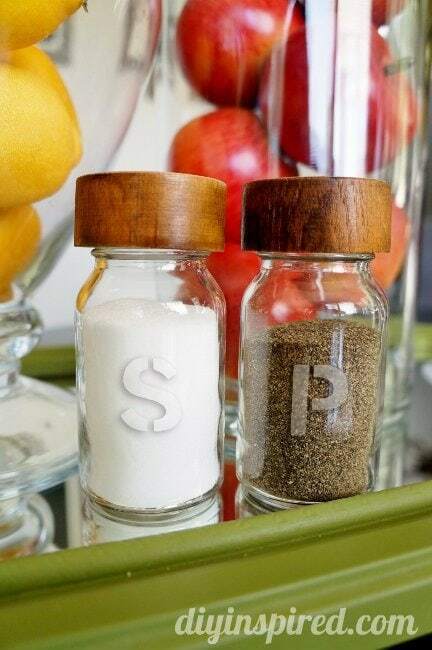 I poured in my salt and pepper and these spice jars still had the rubber shaker lids with holes. These would make a fun gift or you can be greedy like me and keep them all for yourself! What is glass etching cream? Glass etching cream is a fast acting formulated cream that allows you to create permanent designs on glass or mirrors. The chemicals that are in etching cream are barium sulfate, sulfuric acid, sodium bifloride, and ammonium biflouride. It is not recommend for use with children under the age of 18. What types of projects can you do with etching cream? You can decorate windows, mirrors, household glassware, or picture frames. 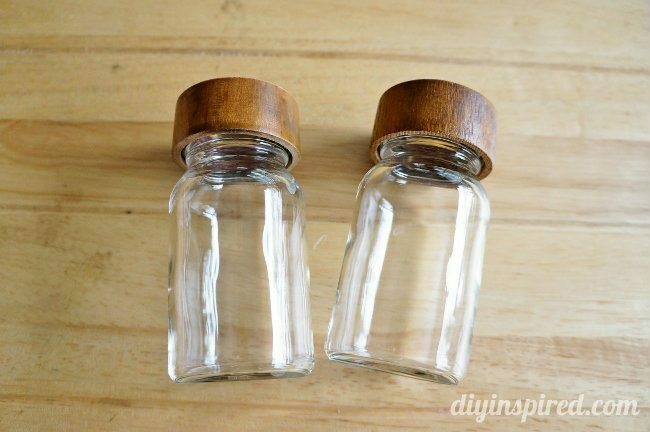 I have made etched glass laundry detergent containers. How do you remove etching from glasses? Etched glass designs are permanent, so you cannot “erase” any mistakes, rather cover them up with a different design. 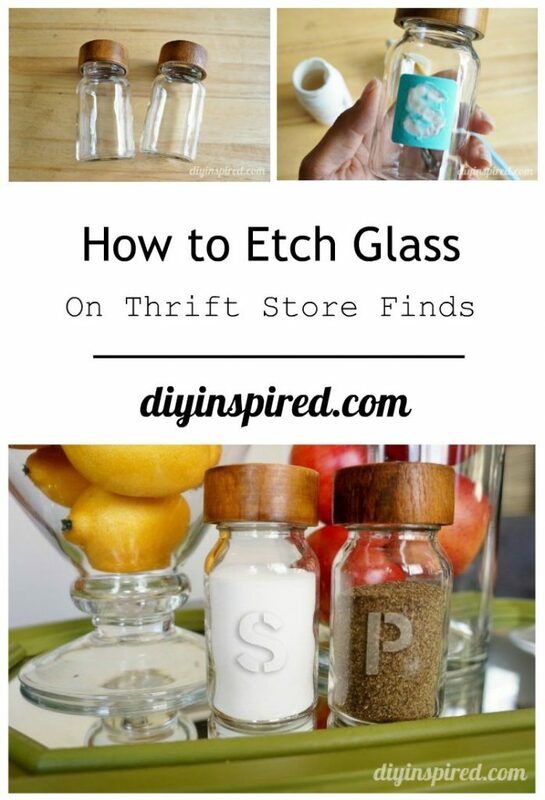 Can etched glass projects be washed? Yes. You can wash glass that has been etched in the dishwasher just like any other glass. Note: I originally wrote this post on August 25, 2014. I kept these salt and pepper shakers until about a year ago when a reader fell in love with them and contacted me. She was so sweet. 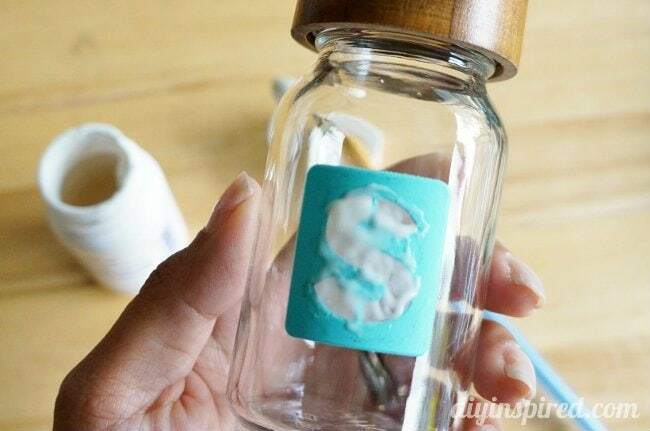 She went on several thrift store shopping hunts to find similar jars so that she could do this tutorial. After no luck, I decided to send her mine. So, I parted with them and sent them to her to enjoy. Those look rustic in a very elegant way. Love them! I never thought etching was so simple. I going to try it soon. Thanks Dinah! Thanks, Corina! The first time I etched glass, I couldn’t believe that’s all it was! So easy… and one small bottle lasts a long time. Love them! Hope I can find the same jars!